"As Facebook closes in on the 1 billion users milestone, the social network is quietly testing a feature that will require users to open their wallets to bring more attention to themselves. Likely related to proving Facebook’s revenue potential prior to the IPO, the social network is testing out a new feature that charges users to highlight a recent post among their friends. Within the example pointed out by Stuff, the user could pay $1.80 to bring extra attention to a specific Facebook status update, photo or video. The user would pay by credit card or Paypal to complete the transaction, however there is no indication that the user will be able to see metrics like how many of their friends actually saw the post. According to Facebook, the company is testing a variety of price points including free, but the free sample may just be an attempt to attract more users into the program." 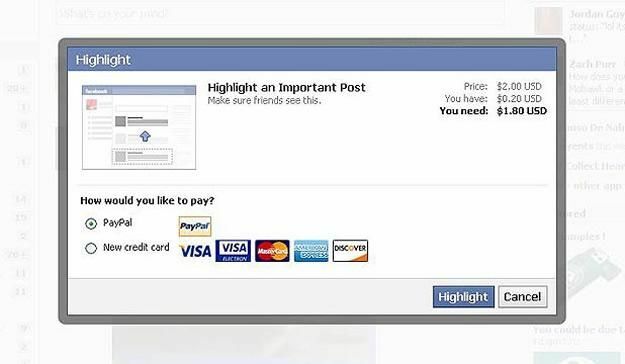 It may happen very soon to that make you paid for highlighting posts on Facebook. Bad attempt, still lets see how it can work for business, it just in a testing procedure. To Read more how facebook will charge users to highlights posts on fb.